The sliding-scale is a means of keeping the classes accessible. It allows you to select from within a range what is manageable for you, while still ensuring the longevity of the classes, thanks to those who can afford to contribute more. The top of the scale is the price, but you can discount that amount however much you need to within that range. We never want cost to be a barrier — everyone should enjoy the benefits of community, fitness, fun, and rhythm! Comfortable clothing that you can move in. There is no “uniform” for any of the classes. Yoga-style fitted clothing are recommended over baggy clothes, for the simple practicality of not getting in your way. Some people like to wear a pagne (wrap or sarong) for the West African dance classes. This helps you get “in character” and leave the everyday outside. Recommended! But not necessary. Bare feet are recommended for all of our classes, except Bellyfit and Ballet. The Bellyfit system was designed to be safe & effective when done in supportive footwear. Ballet: ballet slippers allow for turning; socks are an ok alternative, though a bit too slippery. Slippers are a suggestion, not a requirement. For all of human evolutionary and modern history, being barefoot has been and is normal, at least for part of the day. In many religions, bare feet are seen as a sign of humility and respect. Many shoes limit the flexibility and mobility of the foot, and can lead to higher incidences of flat-feet or toes that curve inwards. Being barefoot results in a more natural gait, allowing for a more rocking motion of the foot and eliminating the hard heel strike, generating less collision forces in the foot and lower leg. People who habitually dance barefoot generally have stronger feet, with better flexibility and mobility, fewer deformities like flat feet or toes that curve inwards, and less complaints & discomfort. As you dance barefoot, the muscles of your feet are prompted to move and develop more, with the result that you have toned and stronger foot muscles. 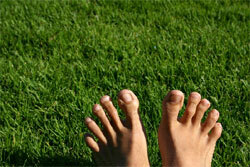 Being barefoot helps the leg muscles pump blood back to the heart more efficiently (avoiding varicose veins). In traditional exercises like yoga and tai-chi, it is believed that being barefoot helps a person absorb Prana or Chi, the life-force energy. As you dance with your feet bare, you increase your vitality. A wider range of hip mobility and more flexibility of the gluteal and hamstring muscles.